Africa's First Swarm Party? 3 Bands, one matchstick, 1 Record! This is my next BIG step that I've been planning for months! I hope you can come join in the fun? The one matchstick Swarm Party. 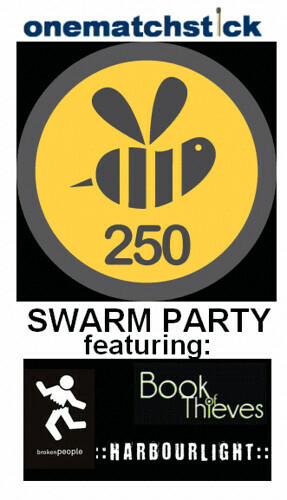 Join us for South Africa's biggest Swarm Party! It's a foursquare flashmob! A Swarm Party involves an online flashmob on foursquare.com (the location-based networking site) that unlocks the coveted and hard to get Super Swarm Badge. The party is a way of 250 or more users checking-in to the party location to collect their virtual badge and points. Please note that the SWARM was moved to the Bluesroom on 20 November, and there are now 4 bands and glow sticks.